For us, your satisfaction is the center of our action. We have run a store in the city center of Bielefeld for more than 20 years. We owe this success to the fact that our customers are regulars, they are customers who have come to us for decades. Because coins are a very special product. Those who buy or sell coins must be able to trust in the reliability of their partner. We offer you this good feeling. Whether you are looking to build or sell a collection, you can rely on our fairness. The enthusiasm about coins has made me a coin dealer. That is why in 1982, after having completed my military service, I decided to do an apprenticeship in the field of coin dealership. I received this training at the biggest numismatic auction house in Europe where I worked my way up to executive department manager for coins of the German Empire. 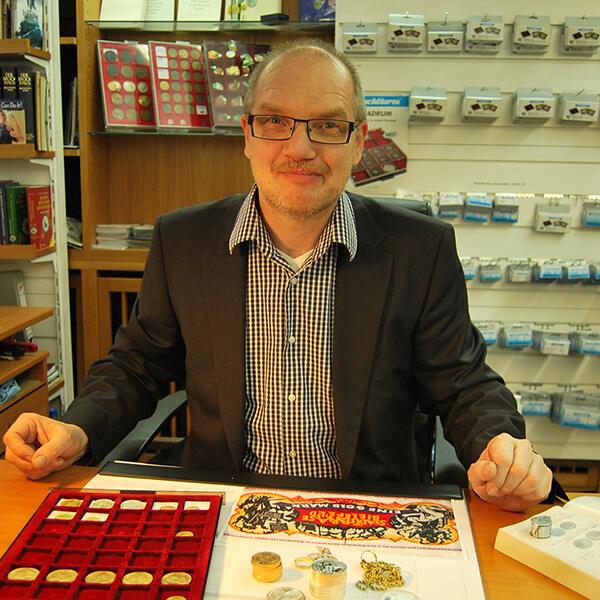 After 15 years, I returned to my home town of Bielefeld to fulfil my dream of opening my own coin store. A special place in my heart is reserved for German coins – along with all numismatic testimonies from Bielefeld, of course. I am an internationally renowned specialist of coins of the German Empire as well as German fractions starting from 1800. But as the owner of a frequently visited store one cannot only follow his own preferences. Which is why I am a all-rounder and will estimate every coin you put in front of me. As a member of the Verband der Deutschen Münzenhändler and the European trade association FENAP, I voluntarily adopted special rule of due diligence. Based on my knowledge and experience, I warrant that the coin you buy at my store is authentic. In August of 2018, we celebrated the 20th anniversary of my store. I owe this success to the faith and loyalty of my regular customers. Because dealing coins requires trust. I am proud to say that due to my fairness and reliability I have won the trust of many customers.